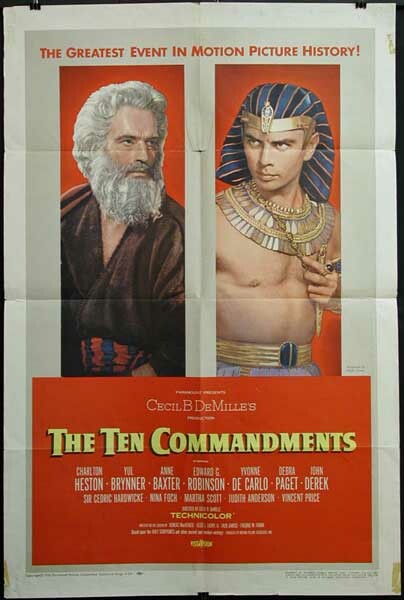 I had to find an illustration that included my favorite hunk, Yul Brynner, along with one of the other great Hollywood hunks, Charlton Heston. Now THERE were men! Anybody who missed Sunday night's fascinating History Channel broadcast of "The Exodus Decoded" might like to tune in tonight at 8 and 12 EDT and also Saturday at 5 p.m. and September 7th at 10 a.m. to catch a rebroadcast. This is particularly interesting in light of the previously posted article about the eruption of the ancient volcano on Santorini, which has now been determined to have been much larger and as having more widespread effects. The reason Santorini is important in the story presented in the History Channel broadcast is that by dating the period of the Exodus to a much earlier time than had been previously supposed, the filmmaker was able to find historical proof of the story of the eviction of the Israelites, their pursuit by the pharoah and even of the parting of the Red Sea. By setting the date of the Exodus to the earlier time period the author was able to make a connection with the eruption of Santorini, which would have explained all ten plagues mentioned in the Bible as well as the parting of the waters of what was actually a shallow lake called the "Reed Sea". The author even claims to have found the exact location of Mt. Sinai. What is particularly galling when you watch the broadcast is the strictures placed on archeologists and historians by the Egyptian government, which is terrified lest any new finding cast Israel's claims on the land any more justifiable. Once again, Islam stands in the way of science and seeks to eradicate everything but that which concerns Islam. They destroyed the Bamiyan Buddhas, they will also seek to destroy the pyramids, which devout Muslims revile as infidel temples. Only the tourist dollars so far are keeping them from doing this. But that isn't keeping them from obstructing ongoing archeological finds. Don't miss this show - I was mesmerized. It shows also that often what is needed to find new answers to age-old questions is an interdisciplinary approach, that uses the skills and knowledge of experts who normally don't talk to one another, such as geologists and archaeologists.